What Is It Like To Be Under Regression? 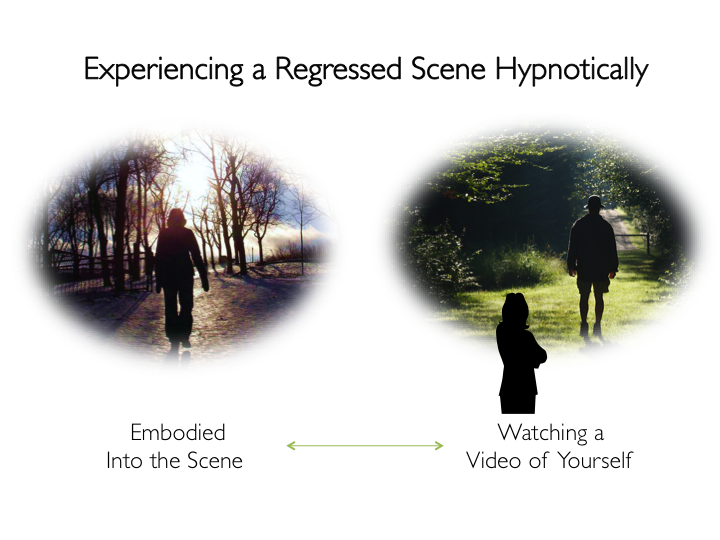 A hypnotic regression is a process in which the patient under hypnosis recalls a series of memories from the subconscious mind from any point of his lifetime. Apart from memories, the subconscious mind is also the seat of our emotions, imagination, habits and intuition and is therefore the very essence of how we experience ourselves in the world. Major events from childhood, both positive and negative in nature, can have a tremendous impact on our lives. Hurtful events, particularly if emotion-laden, can serve as an imprint and greatly influence the way we view and experience ourselves in the world. We carry traumas from the past with us into the present and we filter our world views through the lenses of past experience. Some of the memories of past experiences may be unpleasant, painful and difficult to cope with and we tend to push them down to the hidden reservoir of the subconscious. A hypnotic regression can be very healing and transformative. It often brings up new insights as to what really happened to us as a child. It may be a severe problem that has been difficult to overcome through the growing years or it could be an unexplainable emotion, behaviour or compulsion that has puzzled us. If the ongoing or recurring difficulty is the result of a past traumatic experience, regression therapy is particularly helpful. Over and above the emotionally charged events in one’s current life, the underlying cause of the patient’s problem can sometimes be found in the memories of traumatic experiences in other lifetimes. In these situations, the process of memory retrieval is called past life regression. The experience of a hypnotic trance is nothing unusual. In fact, it feels similar to countless other moments in our life where we were absorbed in a zone, lost in thought, or perhaps meditating. As we enter a hypnotic state, we dissociate our mind from the body and its surroundings. The awareness is withdrawn from the normal alert state and goes inwardly. In this inwardly-focused state we are able to harness the full potential of our imagination without the normal restrictions of the critical mind. This is when the therapist can help to make significant and dramatic changes in a patient’s life. Once embodied in the past event, the patient experiences an identifiable figure which represents another version of himself on a dream-like journey into an earlier part of his life, or in another lifetime. This identifiable figure can be experienced in one of two ways: (i) he feels the figure as another part of his personality, and yet not quite like himself, or (ii) he feels inexplicably drawn into the strivings and emotional state of this figure, as if he is living in that body himself. Whichever the experience, the personality will have a life history of its own, waiting to be unveiled by the regression progress, with the help of the therapist. The reliving of one’s past life experience is akin to viewing a fast-forwarded video-recording of one’s history in that lifetime. As the story unfolds under trance, the metaphorical significance of the events of that lifetime is unraveled by the workings of the subconscious mind, bringing insight as to how the patient’s unexplained symptoms could have their origin in that lifetime. Once the patient is brought back to conscious knowledge of his forgotten experience, the symptoms often disappear. This is because recognition of his disturbing feeling as belonging to a previous era dissolves the symptomatic projection. He now learns to put his emotion back to this proper time sequence, and healing commences. While the patient is reliving a past life experience, the therapist may need to assist him to re-enact the past life script in order to unlock and clear the blocked emotions embedded in that disturbing event. Being both a participant and a witness to the event, the patient takes on a new perspective as a new meaning of the event emerges. For instance, if the patient under trance looks at his suffering in that lifetime from the perspective of the history of the society rather than from his personal context, it becomes easier for him to overcome the pain of his personal suffering. This process of understanding the true nature of the situation is known as reframing. The resulting new insight leads to a shift in consciousness, which in turn leads to a change in character traits as the patient understands where his emotions are rooted and why he has been holding on to them.